Medley Polyester Variegated Thread by Exquisite can bring any project to life! With vibrant colors and reliability that you can only get from Exquisite, Medley is a sure hit. Each Medley spool is a precision-dyed blend of three to four colors that repeat at regular intervals. 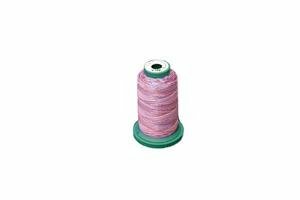 Create life-like blended fills or make fun personalization’s with this rich, dimensional 40 weight thread. Suited for machine embroidery, sewing, or quilting. Available in 15 unique variations.